Are you looking to drive more traffic to your blog? There are many tips, tricks, tactics, and strategies on how to do it. But the average blogger is often left scratching their head on how to actually do it. Is it a skill that can be developed? Is there a secret tactic that will send floods of traffic to my site? Can I drive traffic to my blog without feeling salesy? Many beginners are often scared to get started with paid traffic. They automatically shut down the idea claiming “they can’t afford it.” My goal today is to help you overcome that myth and help you see that you can get targeted traffic to your blog with as little as $1 a day. Specifically, I’m going to show you how to boost a post on Facebook. When it comes to Facebook ads, I want you to see it as a water faucet. It’s something you can turn on and off anytime you want. If you are frustrated with the lack of traffic coming to your website, then why not buy some? Let’s get some eyeballs on that awesome piece of content you worked so hard to create. Use the following steps like a checklist, and you’ll have traffic to your blog by the end of the day. If you don’t already have a Facebook Fan Page, you’ll need to set one up in order to run Facebook ads. There are basically two types of Facebook Pages: a company brand and a personal brand. If possible, go with a personal brand. When your name and profile pic is displayed, it will feel less like an ad on Facebook. The best use of a company brand Facebook Page when running ads is for current customers. 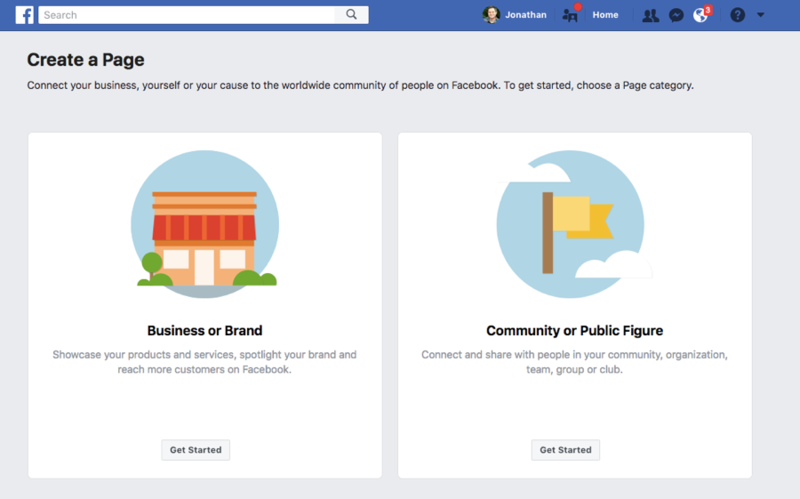 If you are running a flash sale, in-person event, or a product launch it makes sense to use your company brand Facebook Page. This strategy is beyond the scope of this blog post. To create a new Facebook Fan Page, just click here and walk through the step-by-step tutorial. Next, you’ll need to open up a Facebook ads account. It’s completely free and you only need a Facebook account and a Facebook Fan Page to get started. 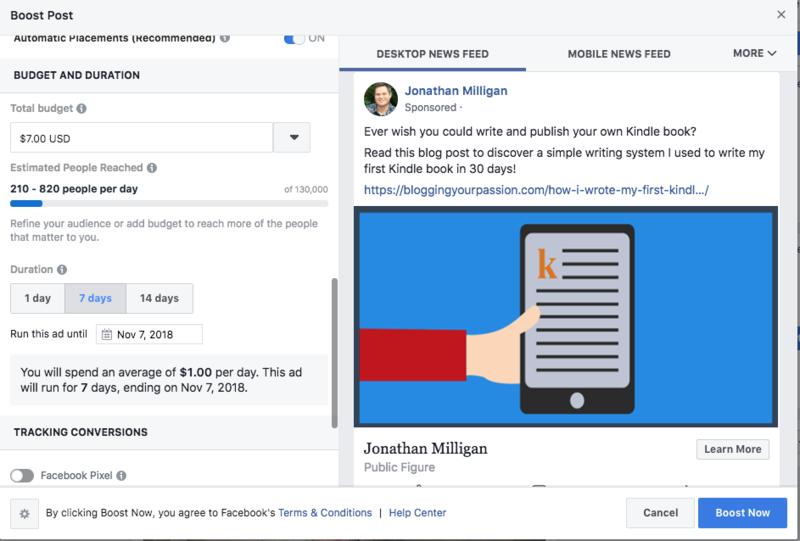 There are a few different ways you can get to Facebook ads, but the one I recommend is through Facebook Business Manager. You’ll need to create an account with your Facebook profile, but it’s completely free. Once you walk through the steps, you’ll be asked to attach a Facebook Fan Page to your account. NOTE: If you are a beginner, don’t get overwhelmed by all the “bells and whistles” inside Facebook Ads Manager. In fact, I’m going to show you how to easily create your ads right from your Facebook Fan Page! For this step, I’m going to assume you’ve already published a few blog posts on your blog. If not, you’ll want to do that first. To get started with running your first Facebook Ad, you will navigate to the Facebook Fan Page you set-up in the first step. 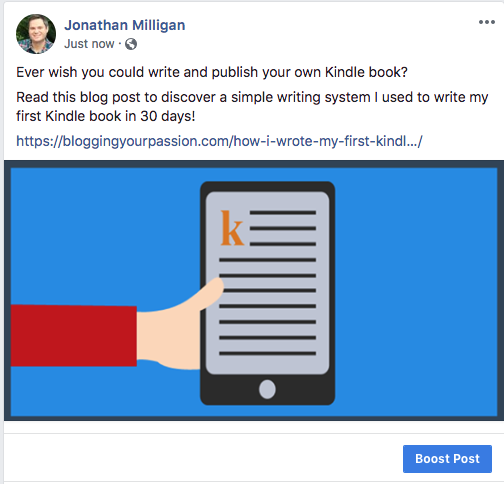 From there, you will write and publish a Facebook post like you normally would. 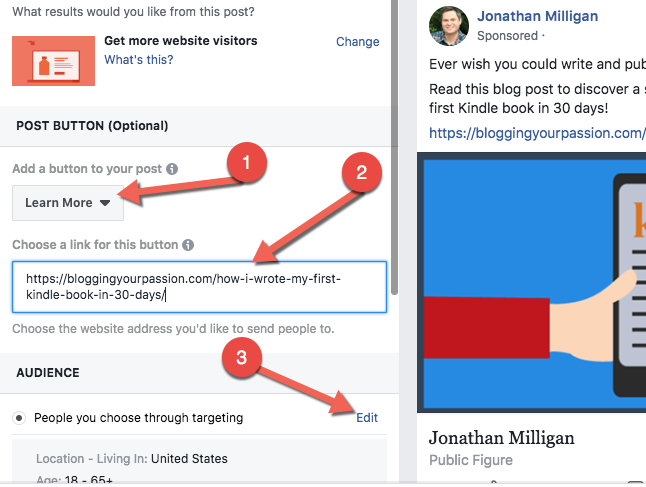 Be sure to include your link and Facebook will do it’s best to pull in the featured image from your blog post (see image). Note: You can always click “add/upload an image” to upload an image you created. You can only see this as the admin of your Facebook Fan Page. 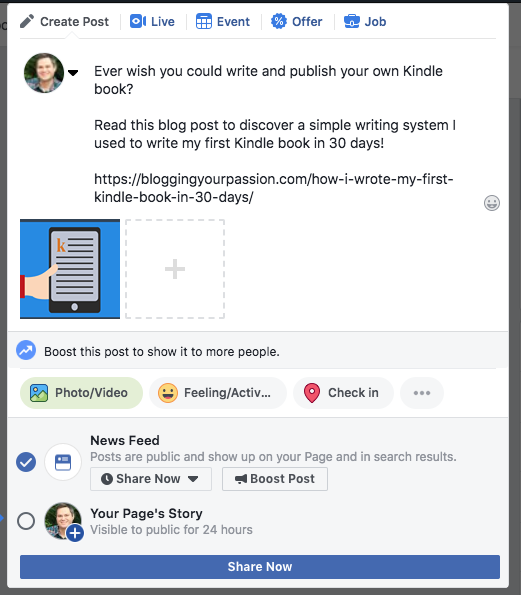 Also, if the boost post button seems greyed out it’s because you are not logged into your Facebook Ads Manager account. Once you hit the button, you’ll have a few decisions to make before the post becomes an ad. Decision #1: Which button do you want to display? I usually select “Learn More” among all of the options available. Be sure to paste in the link to the blog post you will promote. I personally like to hit “edit” under “people you choose through targeting.” You can also experiment with other audience types by scrolling down. After I hit “edit” I look for the section that says detailed targeting (see image below). I will then type in keywords related to the most relevant audience for this post. You can add more than one audience interest. I usually shoot for 100,000-500,000 people for my target audience size. Decision #4: Select the budget and timeline for your ad. I like to adopt Dennis Yu’s One Dollar a Day Facebook Strategy when it comes to testing a new ad. I will spend $1 per day for seven days to see how this ad performs. If it is performing well, I might run it again, or even add a bit more money to this ad. As you can see, this is a simple Facebook Ad strategy that anyone can use to test out paid traffic for very little. What’s the best part? 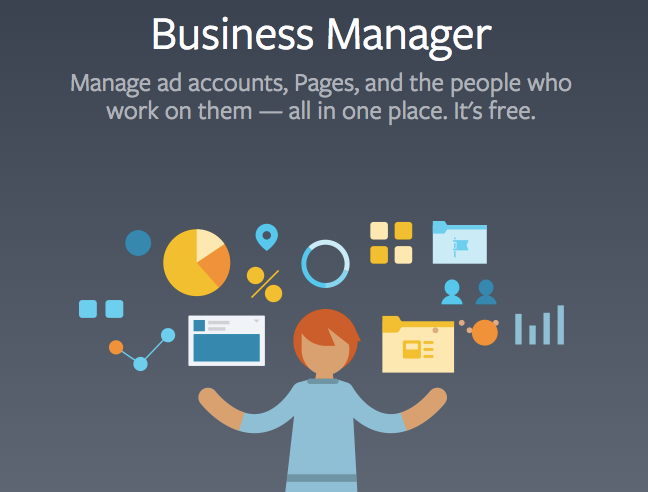 You don’t even have to get into the Facebook Ads Manager to create and manage your ads! You can use this simple strategy to drive traffic, build leads or even leverage affiliate marketing. Now, go get you some traffic!